Hope everyone had a lovely and meaningful Easter! I sure did! My church here in the southwest hosted a beautiful outreach service at an open air theater. The gorgeous red rocks were an amazing backdrop for wonderful music and a powerful resurrection sermon. This morning, in reflection, Philippians 4:8 came to mind—"Finally, brothers, whatever is true, whatever is noble, whatever is right, whatever is pure, whatever is lovely, whatever is admirable—if anything is excellent or praiseworthy—think about such things." It's one of my favorite Bible verses. Well, as I thought about my blog this afternoon, that verse reminded me of an idea I first did for my web site creativefaithplace.com a number of years ago. It received so much response I put it in my book, Inspirational Home, and today I thought I'd put it up here, too, for all you newcomers! It's a simple idea that can be done in so many different ways to create really unique looks. 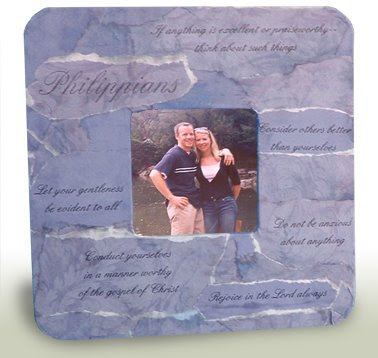 Design a one-of-a-kind picture frame with your own favorite scripture verses. It makes a thoughtful gift for a wedding, a housewarming party, a birthday, or just for your own home. I used an unfinished wood frame with a 3 inch wide flat surface, and 2 coordinating laser-compatible scrapbook papers that match my friend's home. Paint the frame the same color as your solid paper, front and back. This will give the frame a finished look, and also hide any potential gaps in your paper layers. Select your scriptures. (I chose 5 from Philippians.) Type them into your computer and size them to fit your frame surface. Use a font that goes well with the formality or casualness of your paper. Print several verses on the solid sheet and several on the patterned sheet. Then tear the text areas out of the sheets, leaving a rough edge. Without gluing, plan your arrangement of the verses around the frame. Then move those pieces to the side. Now apply the background: Tear more pieces from the leftover unprinted sheets and decoupage onto the frame. To do this, brush the decoupage glue on both the frame and the backside of each piece and smooth into place. Be sure to wrap completely around the sides and smooth out any bubbles. You may leave some gaps where you know a verse piece will go over. Then add your scripture pieces. Be sure you've completely overlapped all pieces. Let dry. 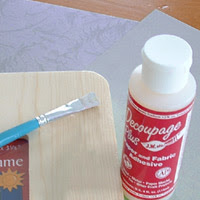 The final step of decoupage is to brush glue over the entire surface, wipe off any excess and let dry. Add a photo and you're all set! Have fun and send your photos when it's done! Don't rub or brush too much over the text or your toner could smear. The paper is delicate, so be careful not to tear as you work it around the edges and corners. Make this a holiday accent by using appropriate holiday-themed scriptures and colors; or an anniversary gift using love-themed verses.